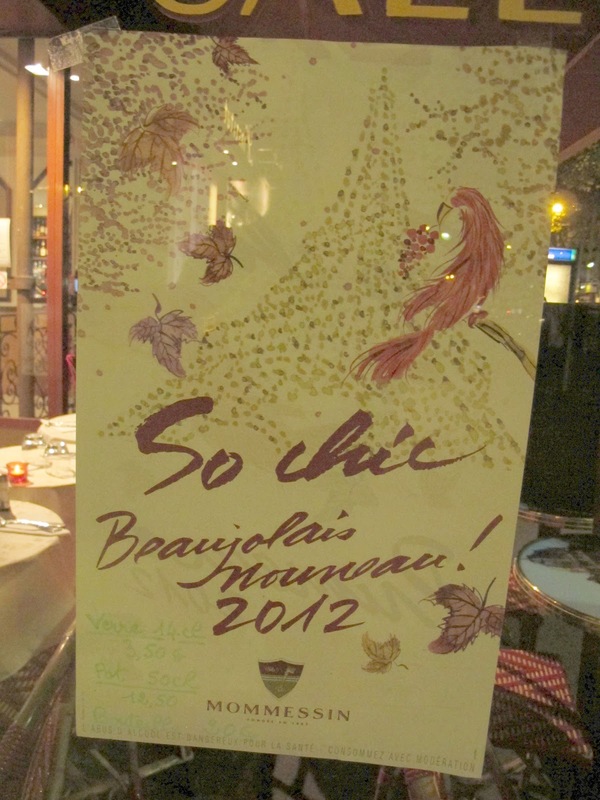 Page in Paris: Happy Beaujolais Nouveau! 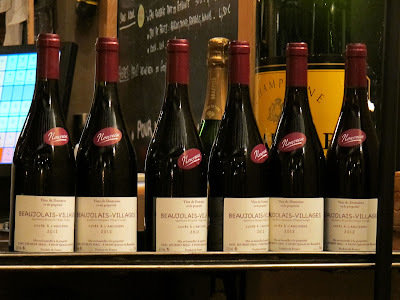 I will forgive those of you who failed to wish me a Happy Beaujolais day yesterday. It is the 3rd Thursday of EVERY November. Same time, every year, just like Thanksgiving, the holiday that always follows it exactly a week after. Those in the US, I can let it slide because I was seeing a lot of invites for events held on Friday or Saturday of this week, so I can understand your confusion, though I can't understand the confusion of the event organizers. I mean, is Christmas on the 25th, or the 26th, or 27th, or whenever you get around to it? Let's move past it, but I trust you now have it on your calendar. There are those who will say that the wine isn't sophisticated enough to take seriously, but I'm sorry, how many other holidays are there during the year whose soul purpose is to celebrate wine? There are many holidays in which wine plays a focal part in the celebration - how else do families get through awkward special occasions together? But on the third Thursday of the eleventh month each year, the focal point IS the wine. Does it look like these people forgot what day it was? 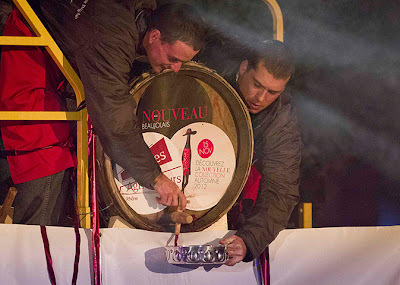 They roll out the barrels in Lyon early Thursday morning and everything flow from there. I couldn't get down to Lyon to be in the thick of it, but luckily Paris still had many celebrations around town. 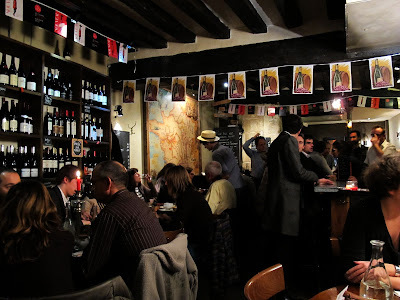 Lisette and I picked the wine bar Le Porte-Pot for our celebration. You could question why we chose to go to an establishment named after a mobile latrine, but once you step inside, you know you're in the right place. There were banners and signs, and of course men wearing traditional, jaunty chapeaux. Le Porte-Pot was serving a "bio" Beaujolais, which means you won't be drinking chemicals, but you might be downing dirt, so you should bring dental floss since there's no filtering. Beaujolais is made from the gamay grape, which does produce some more serious wine like those from Morgon and Fleurie, but we're talking Nouveau here, which means young and ready to go. No aging going on here. Down the hatch as soon as it hits shelves. This year was no different. The ripe red fruit isn't shy, but honestly, wasn't that bad. It's cheap and cheerful. We had the recommend beef bourguignon cooked in the wine of the night. The beef was a little dry, but it was nice hearty fare with the wine, and I suppose it's good to eat a carrot or two now and again. The lamb was even better. It spent 6 hours braising, which might have been about the same amount of time as the Beaujolais Nouveau spent fermenting. No knife was required and the thick cut of lamb was enough to feed most of the bar. It's not a celebration without some cheese. This was a baked St. Marcelin in a honey sauce, which I'm already looking into creating a separate holiday for. It actually put to shame the somewhat dry nut brownie with caramel. Now it's my turn to apologize. The production of Beaujolais Nouveau is down by nearly half as compared to last year. There was some frost and disease at work, so there's not much to go around. For those that are waiting for week-end celebrations, I hope there's enough to go around. Lisette and I drank our share last night, and perhaps a bit more than that, but the waiter ended up being English and had no judgement on any order placed after our first bottle. Yes, we're that dedicated to the holiday. 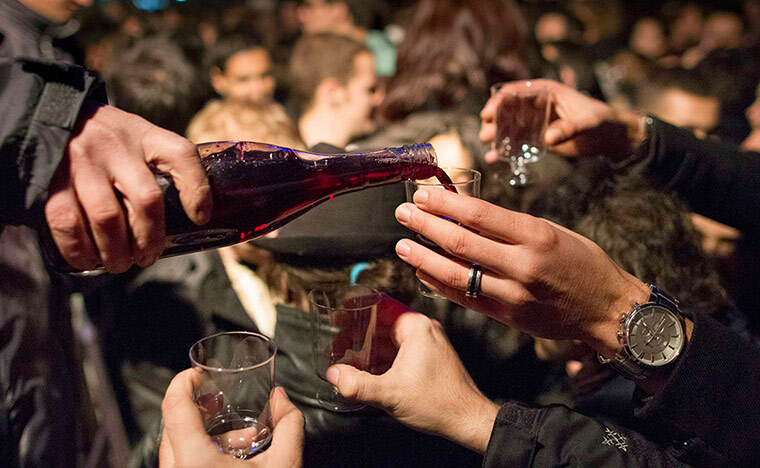 Happy Beaujolais Nouveau to you and yours, no matter when and were you're celebrating!